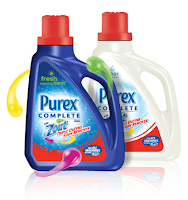 Purex with Zout is available in Fresh Morning Burst and in Free and Clear for people with sensitive skin or allergies. It has three powerful stain-fighting enzymes: Protease, Amylase and Mananase. Each different enzyme targets a different type of stain to give you complete stain removal. The idea of a laundry detergent that has a built-in stain fighter is brilliant. I am a slob. I admit it. When I used to eat ketchup (and any other condiment), it often ended up on my shirt. Wine has been spilled all over me numerous times while drinking. I have spilled food on me within the first 5 minutes of being at the fair. You name it when it comes to stains, and I have probably done it. So, naturally I was thrilled to try Purex with Zout. Purex with Zout did a great job of cleaning my clothes. They smelled fresh and felt clean. Unfortunately, I have not encountered any stains during this review to test out the Zout. So, I can not attest to how well the Zout works. I am sure that I will test it many times in the future and I will let you guys know how it works out. 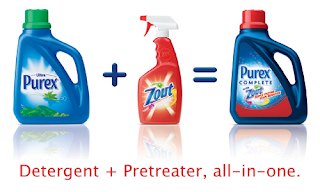 Now if only Purex could add Zout to their 3-in-1 laundry sheets I would be in heaven. Two lucky winners will receive a coupon for a free bottle of Purex with Zout! Giveaway ends 5/28/11 at 9pm EST. Giveaway is for US residents. No P.O. Boxes. Winner will be chosen randomly. Winner will be contacted via e-mail and then will have 48 hours to respond before a new winner will be chosen. Disclaimer: I received the above product(s) in exchange for this review. I was compensated in no way. The thoughts here are my own honest opinions.